This magical painting has a charisma that no amount of analysis can explain. If you don't get it, then that's OK – à chacun son goût – but a lot of people do. Perhaps it's that dreadful populism again that is currently sweeping through the once civilised world. 'Magical', 'charisma' are two words that just say 'incomprehensible to me': perhaps 'other-worldy' would be a better expression. The painting comes from a different time, a different world and is painted by someone with a different mentality to the modern one. It is quite a small painting, barely 17 inches high, and quite gloomy – demanding close inpection, but its charisma stops art gallery visitors in their tracks. We know next to nothing about the painting, ditto the painter. All dates are just slightly informed guesses. Other later and more sophisticated painters played with light and dark, set up external light sources such as candles, sunbeams and moonbeams to highlight the central motif. 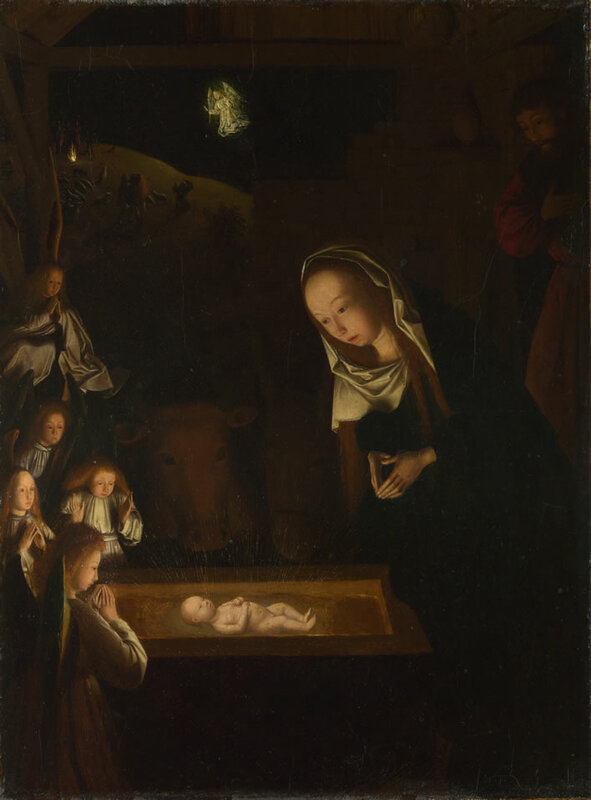 In the central group of this painting the baby Jesus is the source of light that illuminates the other figures with its radiance. Geertgen was not the first person to use this visual conceit, but in this painting he used it to great effect. 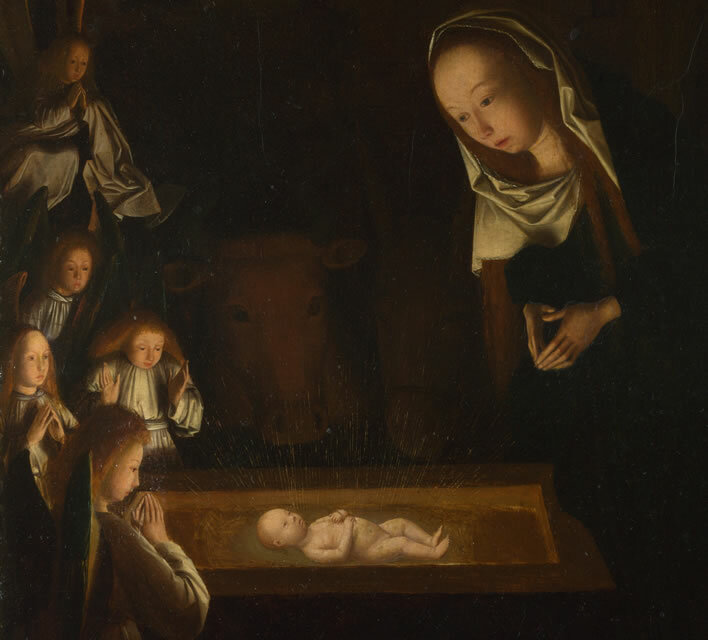 The baby Jesus is not swaddled, but naked – his body radiant, undimmed by clothes. The manger is a manger, not a crib. All but one of the angels have their hands clasped in prayer; one has the open hands of wonderment and surprise that we saw in Lorenzo Lotto's startling painting of the Annunciation, made only a few decades later. 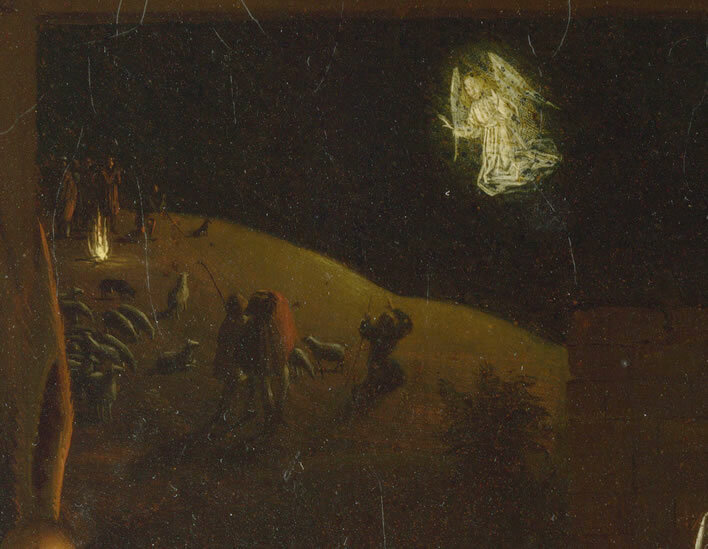 The angels appear as small, fully clothed females, illuminated but not radiant, in no way challenging the visual dominance of Mary in the composition. For the same reason, their wings are not white but dark iridescent colours, like the wings of birds. There is a dynamism in their placing: they look as though they have just entered through the opening at the back of the stall, descending like a group of birds down to the manger. Mary's face is the second most important highlight in the picture after Jesus. It has very lightly modelled features – one could almost call it 'blank' if it were not for the astonishing intensity of her gaze. There is no distraction of facial detail but nonetheless an expressive power that is quite remarkable. The large heads of an ox and a donkey loom out of the darkness behind the manger. They are very dark, mere suggestions, as they have to be in order to avoid overpowering the main characters of the central group. The only other source of light and wonder is the angel announcing the nativity to the shepherds who are 'watching their flocks by night'. We see this through the opening at the back of the stall. This angel is not like the small, dark, bird-like angels around the manger. This is the full size, brilliantly majestic angel sent to cause wonder in the world. 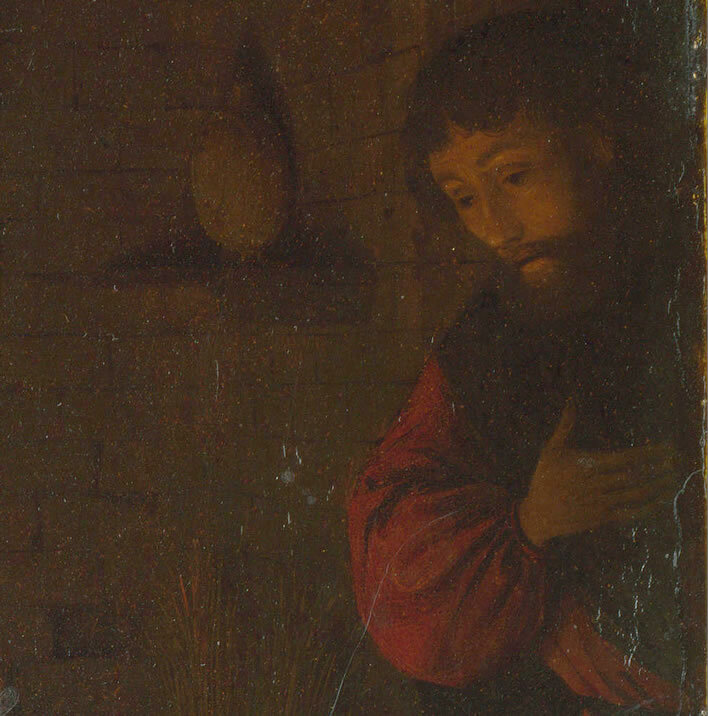 Barely visible in the gloom on the upper right of the painting is Joseph, his right hand over his heart. We have lightened this detail to bring him into view, he might easily be overlooked otherwise. He has played no role in this event, neither in the conception nor the delivery. Unlike certain other religions, the Judeo-Christian matriarchal tradition is made manifest: he was allowed to lead the donkey on the way here. Well, there you are. Lots of analysis but we are really none the wiser. We should have stuck to 'other-worldly' and let it go at that.